There is a grand tradition of physicians who are also great writers and philosophers. From Copernicus and Paracelsus, to Chekov, Osler and Frankl. And most recently Sherwin Nuland and Oliver Sacks have gained broad readerships and made huge contributions to the way we think and the way we live our lives. Andrzej Szczeklik is entirely worthy to join their company. When his first book, Catharsis, was published in English, critics from Seamus Heaney to Czeslaw Milosz stood to applaud. Now he has followed with an ever deeper and more accomplished book. It has become unfortunately rare for a scientist or doctor to find his grounding in a broad understanding of literature and the humanities. 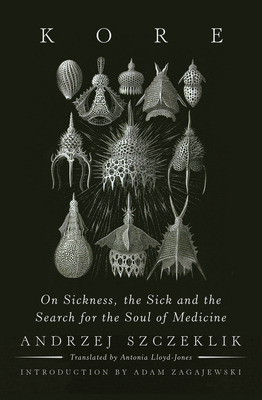 But in Kore, the author insists that only with a curiosity thoroughly at home in both worlds can one expect to discover what we should mean about sickness and about the soul. No tedious academic, Szczeklik writes with the grace of a poet and the ease of a fine storyteller. Anecdotes drawn from a personal immersion in art, music, and literature are woven with reports on experimental medicine and daily clinical experience. From DNA and the re-creation of the Spanish Flu virus, to contemporary research in genetics, cancer, neurology, and the AIDS virus, from "Symptoms and Shadows," to "Dying and Death," to "Enchantment of Love," every chapter of this book is alive and engaging. The result is a life-affirming work of science, philosophy, art, and spirituality.